Weld-On 711 is a grey, heavy bodied, medium setting, high strength PVC solvent cement for all classes and schedules of pipe and fittings through 300mm diameter, including Schedule 80. It has good gap filling properties and its medium set allows more working time in warm weather. 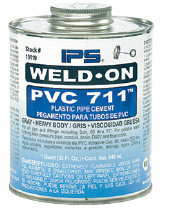 Weld_on 711 is for use on all types of PVC plastic pipe applications, Type I and Type II. Water pressure systems, irrigation, turf, conduit, industrial pipe applications, sewer, drain, waste and vent systems. Detailed directions on making solvent cemented joints are printed on the container label. An installation video covering solvent cementing is available. It not only describes the basic principles of solvent cementing, but also covers the handling, storage and use of our products. It is highly recommended that the installer review the instructios supplied by the pipe and fitting manufacturer. NOTE: IPS Weld-On solvent cements must never be used in a PVC system using or being tested by compressed air or gases. Weld-On 711 meets ASTM D-2564 and is listed by NSF International for use on potable water, sewer, drain, waste and vent systems. It is listed by the International Association of Plumbing & Mechanical Officials (IAPMO) and carries the Uniform Plumbing Code (UPC) seal. Weld-On 711 is listed by the Canadian Standards Association (CSA) for pressure and non-pressure applications. This cement is suitable for use with PVC piping systems approved by (SBCC) Southern Building Code Congress and (BOCA) Building Officials Congress of America. This product is intended for use by skilled individuals at their own risk. These suggestions and data are based on information we believe to be reliable. Installers should verify for themselves that they can make satisfactory joints under varying conditions. Toward this end, it is highly desirable that they receive personal instruction from trained instructors or competent, experienced installers. Contact us or your supplier for additional information or instruction.